I've been there a dozen times or more, and I made all the rookie mistakes, so you don't have to. This guide will help you have more fun with less hassle. Whether this is your first visit or your ninety-first, you may also want to know what's new at Universal Studios Hollywood this year. Buy your tickets online before you go. That is unless you have a child who is more than 10 years old but less than 48 inches tall. 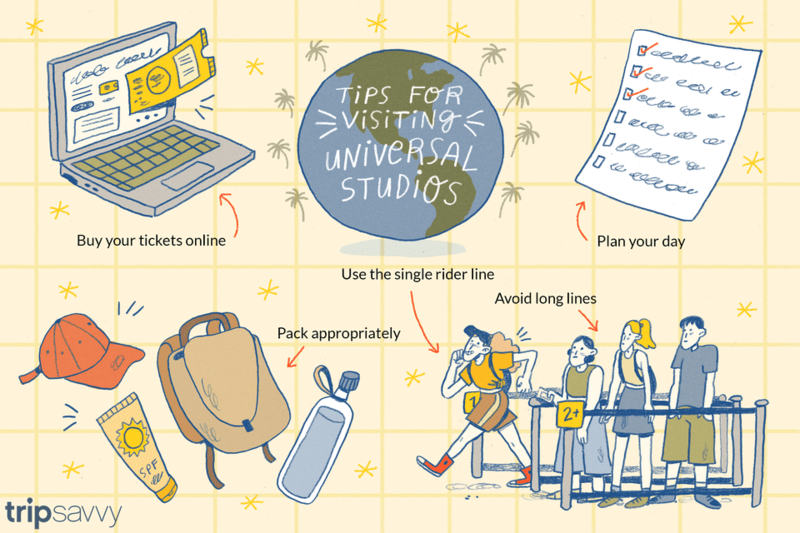 To find out why that is, why buying online might save you money, and where to buy your tickets, check the Universal Studios Ticket Guide. It's unlikely to rain in southern California from mid-spring through mid-fall, but if it does, Universal has you covered. They offer a rain check. If more than one-eighth inch of rain falls by 2:00 p.m., you can ask for a rain check at the Guest Relations office anytime before the park closes. Rain checks are good for a free return visit anytime within the following 30 days. You may not need that rain check, though. Most outdoor shows and strolling characters move indoors, and most rides are already inside buildings. Is Anyone Under 48 Inches Tall? That's 122 cm if you think metric. Many rides have height limits for safety's sake, so smaller folks don't slide out of the restraints. If you have children, you may not be able to avoid a temper tantrum when they find out they can't go on the ride they've been dreaming about — but you can keep the uproar at home. Measure their height before you go, check the height restrictions and let them get over it before they arrive. For some rides, kids shorter than 48 inches can still ride if they bring along a Supervising Companion (who must be 14 years or older). The requirements for each ride are listed in the Universal Studios Ride Guide. If more than one adult is visiting the park with kids who can’t (or don’t want to) go on a ride, you might think that the adults will have to stand in line separately, taking twice as long for every ride. At Universal, you don't have to do that. At any ride with a Child Switch option, get in line together. When you reach the ride entrance, one adult rides while the other waits with the kids. When the first adult returns, they swap off. You'll find Child Switch noted outside the ride and on the park maps. Another option for one person riding by themselves is the Single Rider line available at some of the busiest rides. It will get you on faster. Family restrooms are located on both the upper and lower lots, near the first aid stations. The little ones will enjoy the Silly Swirly Ride and the water play area next to the Despicable Me ride. Kids of any size and age can go to the shows and on the tram tour, too. Think about arriving mid-day for shorter lines. You'll avoid the crowd that gathers when the gates open and the rush to the rides that happens early, too. For an attraction that has a 90-minute wait at noon, you may be able to walk straight in by 8:00 p.m. And in summer, it's much cooler (temperature-wise) after sunset. The perfect way to plan your day depends on your preferences, endurance and a bunch of other things that I can't predict. Use these tips to help figure out how to best spend your day at Universal. The upper and lower lots are connected by a long series of escalators that take about seven minutes to travel one way. Because of that, you’re better off to do everything on the lower lot in one trip. In the summer, the lower lot is hotter than the upper one. If you can, plan to go down there as early in the morning as possible - or after the sun goes down. If you’re riding Jurassic World, morning mid-afternoon is a better choice because you’re likely to be soggy for a while afterward. The studio tour closes before the park does. During winter, the last trips of the day can be cold and chilly. The best time is mid-day. Even if it's hot, the trams are shaded, and your feet can get a rest. Patience: Waits can be more than an hour at peak times. If you're short on that, get a VIP Pass and take it instead. Motion-Sickness Remedies: Many of the rides could turn a sensitive person into a puke-a- saurus. Bring the remedy that works best for you. Comfortable Shoes: You'd be surprised how many people walk around with blisters on their feet because they just had to wear that stylish pair of shoes. Quick Drying Clothing: You'll be glad you wore it after Jurassic World - The Ride. Heavy cotton fabrics and jeans get soggy and stay that way for an uncomfortably long time. For Water Play: If your kids are going to play in the splashy part of Super Silly Funland, bring swimsuits and a towel so you can get them dry afterward. There's a changing area nearby. Sun Protection: Sunscreen, hats, and sunglasses, especially in summer. Glasses Case: You'll need it to put them in, so you don't lose them on the rides. 3-D Glasses: If 3-D glasses give you headaches and you use them often enough at movies and theme parks to justify a $20 to $30 investment, you may want to go shopping before going to Universal. Hank Green’s 2D Glasses turn the 3-D back into 2-D, or you can get circular polarized clip-ons for your everyday glasses. You can also buy and bring your own 3-D glasses, which may have better optical quality than the ones at the park. More (and Less) Clothing Than You Might Think: Even on a hot summer day, it can get chilly fast after sunset. During the day, it may be hotter than you think. Check the weather forecast for Studio City, which can be as much as 20°F hotter than the coast during the summer. Rainy Days: Umbrellas are a hassle in a theme park. Bring a hooded rain jacket or poncho instead. In summer, overcast mornings seldom mean rain later. Anything You Don't Need: That includes that pile of discount cards, the office keys and anything else you don't need while you're in the park. They take up space and weigh you down. A small waist pack or sling bag works well to carry the rest. Anything Embarrassing: Your bags will be inspected at the park entrance. Food and Drinks: They aren't allowed inside the park except for water, fruit and baby food. Pets: Animals aren't allowed inside the theme park (except for trained service animals). Leave your furry friends somewhere else if you can. If you bring them on your trip and need a kennel, see the information at the end of this guide. Your Car: If you're staying at a nearby hotel, ask if they have a shuttle. It may save you the cost of parking. If you're too far away for a hotel shuttle, you can ask if there's an MTA station nearby and take that to the Universal Studios stop. Get a good start by choosing the most convenient parking garage. The E.T. garage is the default if you follow the signs. Park there if you plan to visit, but you also can avoid that long walk through CityWalk to get to the gate. Leave the crowds behind and choose the Frankenstein garage instead. To reach it, exit U.S. Highway 101 at Lankershim Blvd. Go north, then turn right onto Universal Hollywood Drive and look for the lot entrance on the left just past the first curve. From the lot, you will take a series of escalators up to the entry plaza. When you leave your car, write down the name of the parking garage and level you're on — or take a pic. If you brought a lot of stuff but don't want to tote it all around, you could leave the extras in the car and go back for it, but doing that is a time-waster. Instead, rent a locker. They're inside the gate near the entrance. If you need to buy tickets, are using a credit card and don't have coupons to redeem, bypass the lines and go to the self-serve machines instead. They're to the right of the main ticket booths. If you bought your tickets online but didn't print them, you might think the Will Call window is the place to go, but it isn’t. Instead, get into the Guest Services line for assistance. On the way in, it’s easy to mistake the ticket line for entrance line. Be sure you're in the right one - unless, of course, you just like to wait in lines. Leave the GoPro at home and put away that camera. Most rides have strict no video/photo policies inside. Go shopping at the end of the day, so you don't have to lug your purchases around. Food is expensive, and all-you-can-eat dining passes are too unless you're a really big eater. Take a break, but avoid noon when restaurants are busier, and go out to eat at CityWalk. The escalators between the upper and lower areas could almost qualify as a ride. They are some of the longest and steepest you may ever encounter. Occasionally, guests already feeling the effects of Transformers or Revenge of the Mummy may start to feel so nauseous that they decide to get off and use the stairs. If you have mobility issues, baby strollers or just don't like to ride on escalators, ask any staff member where to find the elevator. If you’re a larger person and find that you can’t fit into the rides, you can still enjoy the shows and studio tour. If you feel like you didn't get enough for your money, you can get a refund at Guest Services instead. You can get wait times several ways: Use the Universal Studios app, their mobile website, or check the wait times posted in the park. Of the three, the mobile website is most convenient. It gives wait times that matched the posted ones and the next showtime for each show. You can find it at http://m.universalstudioshollywood.com/waittimes. However, the mobile website lists only the next showtime and not the whole day’s schedule. If you want to plan shows for the entire day, grab a paper schedule instead. You can find them near the entrance. You'll find the free Universal app on iTunes. For Android, the app is available on Google Play. No matter where you get your app, it's best to download it before you go. Before you use it for the first time, it needs to download data, which can take a few minutes. Visually impaired visitors can be accommodated, and signers can be provided with notice. Call at least two weeks ahead of time to arrange for signers or to discuss any special needs you have. Check the Universal website for more information. Universal operates a free kennel service. Go to the Guest Services window outside the entrance to check in. You don't need to bring any certificates or vaccination papers to use the kennel. The kennel provides water only, so you'll need to bring your pet's food - and plan to return if you need to feed them during the day.